This book empirically examines health care financing reforms and popular responses in three major cities in East Asia: Shanghai, Singapore, and Hong Kong. It adopts a new revised version of the theory of historical institutionalism to compare and explain the divergent reform paths in these three places over the past three decades. It also examines forces that propel institutional change. The book provides three detailed case studies on the development of health care financing reforms and the politics of implementing them. It shows that health care systems in Shanghai, Singapore, and Hong Kong were the products of Western presence in the nineteenth century. It illustrates how greater attention is paid to the roles played by ideas, actors, and environmental triggers without abandoning the core assumptions that political institutions and policy feedback remain central to impact health care financing reforms. It shows that health care financing reform is shaped by a complex interplay of forces over time. 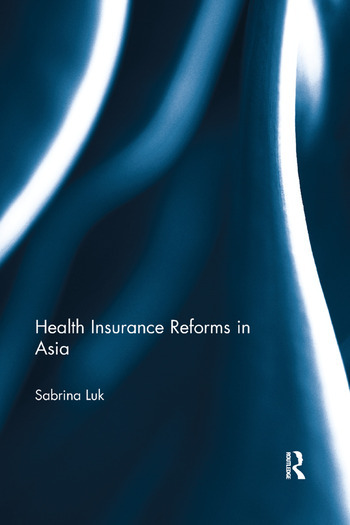 It also provides the most updated material about health care financing reforms in Shanghai, Singapore, and Hong Kong. The central argument of this book is that health care financing reform is both an evolving process responding to changing circumstances and a political process revealing an intricate interplay of power relationships and diverse interests. It shows that institutional changes in health care financing system can be incremental but transformative in nature. It argues that social policies will continue to develop and welfare states will continue to adapt and evolve in order to cope with new risks and needs. This book sheds new lights on understanding the politics of health care financing reform and sources and modes of institutional change. Sabrina Luk is Associate Professor at the Faculty of Management and Economics, Kunming University of Science and Technology. She was awarded her PhD from the Department of Political Science and International Studies, University of Birmingham, and her MPhil and Bachelor of Social Science (First Class Honours) from the Department of Government and Public Administration, the Chinese University of Hong Kong. She was the winner of the 2012 Michael O’Rourke PhD Publication Award at the University of Birmingham for her research contributions and publication record. She is also the Highly Commended Award winner of the 2013 Emerald/EFMD Outstanding Doctoral Research Awards in the Healthcare Management category.